As Ovo Energy is appointed supplier of last resort for customers of the latest failed retailer, Economy Energy, the challenges of the market could mean the worst is yet to come. It hasn’t been the happiest of new years for the energy retail market, as the trend of failing suppliers seen in 2018 continues. Economy Energy became the latest company to fall victim to the challenges of the volatile market on 8 January. This was just a day after Utility Week reported that Economy was likely to enter the supplier of last resort (SoLR) process when the company was revealed to be in credit default. Elexon, the administrator of the balancing and settlement code, published a level two credit default notice for Economy Energy on the BM Reports website. The notice indicated that the supplier’s outstanding charges amounted to more than 90 per cent of its credit cover. Following a similar pattern to Iresa, which ceased trading in July 2018, Economy Energy exited the market subject to a provisional order from Ofgem, which banned the ­supplier from taking on new customers. Economy was also prevented from asking for one-off payments or ­increasing direct debits until it could prove it had resolved customer service and credit balance issues. With 235,000 domestic customers, Economy Energy is the second largest retailer to enter the SoLR process. It comes hot on the heels of the largest supplier – Spark Energy – which had a customer base of 290,000 and entered the process in November last year. Ovo Energy came to the rescue of both sets of customers, which has seen it acquire more than half a million additional accounts in as little as two months. The move secures Ovo’s position as the largest challenger brand, with 1.5 million customers ­(including Corgi Home Plan). Ovo was the first of the smaller suppliers to reach more than one million customers, last November. 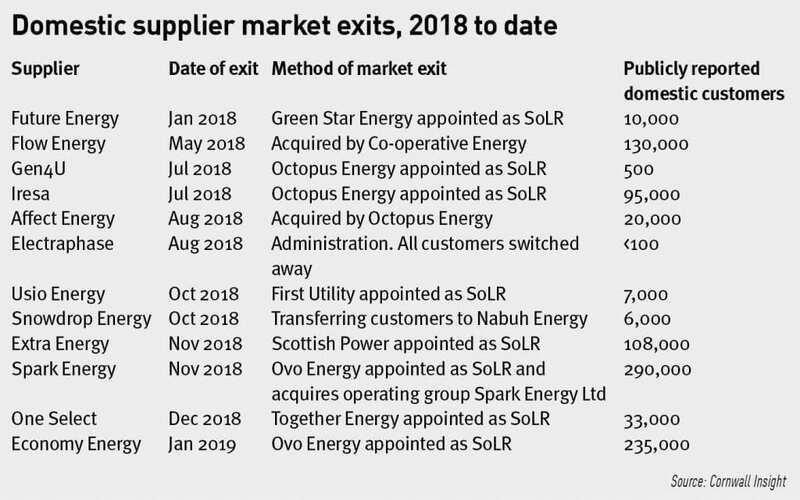 Not only was Ovo confirmed by Ofgem as SoLR for the almost 300,000 customers of Spark Energy on 27 November 2018, the Bristol-based company also acquired Spark’s operating group, Spark Energy Ltd. Speaking at the time, Stephen Fitzpatrick, chief executive and founder of Ovo, said: “The energy sector is going through a major change and many companies, big and small, are struggling to adapt. We are delighted to have been able to bring Spark into the Ovo Energy Group, securing a good outcome for their customers and the team. Chris Gauld, chief executive of Spark, added: “This is great news. It means Spark becomes part of a very successful large ­independent energy supplier. Ovo was appointed SoLR for Economy Energy on 11 January. This time, it has made no mention of plans to acquire the brand. Ofgem selected Ovo to take on the 235,000 customers of Economy Energy after a competitive tender process run by the regulator to get the “best deal possible” for customers. Ovo has agreed to honour all outstanding credit balances, including money owed to both existing and former customers of Economy Energy. But the company has gone a step further, outlining its intention to absorb all the costs associated with the credit balances and the migration of customers, instead of this being shared by the industry or households. Warm Home Discount customers who have already been approved by Economy Energy will continue to receive their ­payment from Ovo Energy. Customers with prepayment tariffs can continue to top up their meters and will be contacted by Ovo ­Energy’s prepayment brand, Boost. Ovo says the energy market is seeing “major change and rapid consolidation” as many suppliers struggle to “adapt in tough market conditions”. Towards the end of 2018, speculation was rife about Economy Energy’s future in the market – so much so that the supplier published a statement on its website to “assure” customers that it had “no intention” of ­closing its doors. It followed news that the company could be struggling financially after Ofgem revealed Economy Energy was under investigation. Economy was named as one of the 14 suppliers that failed to pay its Renewables Obligation (RO) by the 31 October late payment deadline. It was shown to owe more than £17 million – £15,650,999.63 in RO payments and £1,413,304.97 in RO Scotland payments. The statement published on its website in December said: “In response to the recent speculation and circulating misinformation, we would like to provide assurance that we at Economy Energy have no intention of ­closing our doors. “We will pay our outstanding ROCs [Renewables Obligation Certificates] obligation in full, business will continue as usual for our customers. According to Companies House, Economy Energy extended its accounting reference period from the end of March to the end of September 2018. The company’s next set of results was then due by 30 June 2019. An industry source previously told Utility Week that the sudden change could be a sign the company was facing financial difficulty. The Coventry-based supplier was also thought to be seeking emergency funds to avoid being the next company to fall. According to Sky News, the energy supplier was reported to have brought in accountancy firm KPMG to draft a review of its “strategic options”. These included a cash injection and even an outright sale of the business. Sky News claimed to have seen a document headed “Project Wattley”, which stated KPMG was advising an unnamed utility with “a number of offerings including prepay ­tariffs, and direct debit tariffs”. Economy Energy ceased trading just a day after it was revealed to be in credit default and less than a week after being banned from taking on new customers. A statement on Economy Energy’s website published after the company ceased trading says it is “delighted” that Ofgem selected Ovo to take over the energy supply of its customers. The supplier declined to comment directly. Ofgem will be outlining plans to tighten controls on how suppliers handle customers’ balances this year and is exploring moves to extend regulation to energy intermediaries, according to the regulator’s chair, professor Martin Cave. In a keynote speech at Ofgem’s “Energy of the Future” conference in London on 10 ­January, Cave said the regulator is already consulting on introducing customer service and financial tests for new suppliers. Responding to the collapse of Economy Energy, Gillian Guy, chief executive of Citizens Advice, highlights that the failure of energy suppliers is “becoming an all too familiar story”. She says: “Ofgem’s moves to tighten up the licensing rules should address the problem of unprepared companies coming into the market. Meanwhile, professor David Elmes, leader of the Warwick Business School Global Energy Research Network, argues the failure of suppliers is not just the concern of Ofgem but should also be taken seriously by the government. He says: “Asking the regulator Ofgem to look again on the checks they do on companies is not the only solution needed. The government needs to think again about the policies it makes that Ofgem has to implement. “The recent government policy to set a price cap was just political games between the parties wanting to look tough on the energy companies. “The price cap is making it hard to run a viable retail energy business in the UK. News that Economy Energy has ceased trading, less than a week after Ofgem prevented it taking on new customers, is more evidence that the way energy companies are expected to compete isn’t working. “Last year we saw eight energy companies collapse and the merger between SSE and Npower fall apart. The collapse of Economy Energy shows 2019 is going to be no easier for the energy sector. Economy Energy joins a long list of small suppliers that have ceased trading recently, including Spark Energy, Usio Energy, Iresa, Extra Energy, Future Energy, National Gas and Power, Gen4U, and One Select. ­Snowdrop Energy also transferred all its ­customers to fellow Sheffield-based energy supplier Nabuh Energy in October. 2018 was the toughest year yet for energy retailers, but with the new year being only a few weeks old and already talk of several more suppliers likely to fail, the worst could still be yet to come. Ofgem previously opened three enforcement investigations into Economy Energy, two of which will now close – one into the company’s compliance with the Renewables Obligation and one observing its sales and marketing obligations. The regulator has confirmed, however, that the investigation into whether Economy Energy, E and Dyball Associates infringed chapter I of the Competition Act 1998 will remain open. In May, Ofgem alleged that the two energy suppliers, along with consultancy firm Dyball Associates, breached competition law. The regulator issued a statement of ­objections to the three parties and stressed its findings were provisional.